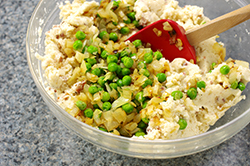 The baby peas are a tasty addition to the standard cheese and potato pierogi familiar to North Americans. If you don’t like peas, you can simply omit them. Ditto for the bacon. Because Poles use ricotta in their pierogi, this version is subtly cheesy – but if you like a cheesier taste, add 1/2 cup/115 g of mild cheddar, Gruyère, or even Parmesan to the filling. Put the potatoes in a large saucepan filled with water, bring to a boil, and continue boiling until soft. Drain and place in a large mixing bowl. 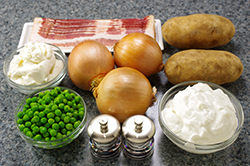 While the potatoes are cooking, fry the bacon in a large frying pan over medium-high heat until crispy. Remove the cooked bacon and drain on paper towels, but keep 1 or 2 tbsp of the fat in the pan. Add the minced onion and cook in the bacon fat until it is soft and lightly browned. Add the peas and continue to cook until the peas are just cooked, about 2 minutes. Set aside. 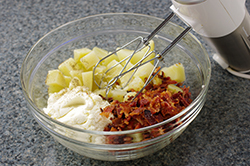 Crumble the bacon and add it to the bowl with the potatoes, along with the cheese. Season generously with salt and pepper, and mash the ingredients together. We use a hand mixer set to low speed. You can use a food processor if you wish, but be careful not to over process: The mixture should be somewhat lumpy – not creamy smooth. 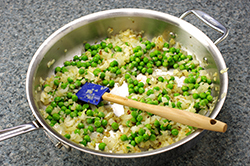 Fold in the peas and minced onions. Taste and correct for seasoning. Meanwhile, melt the butter over medium heat in the same frying pan you used for the minced onion. 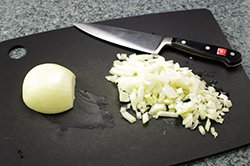 Cook the sliced onions until soft and brown. Do not cook them too quickly; this should take 20 minutes or so. Reduce the heat to low if necessary. When done, set aside and keep them warm. You can cover them with foil and place in a warming oven, or an oven set on low heat. 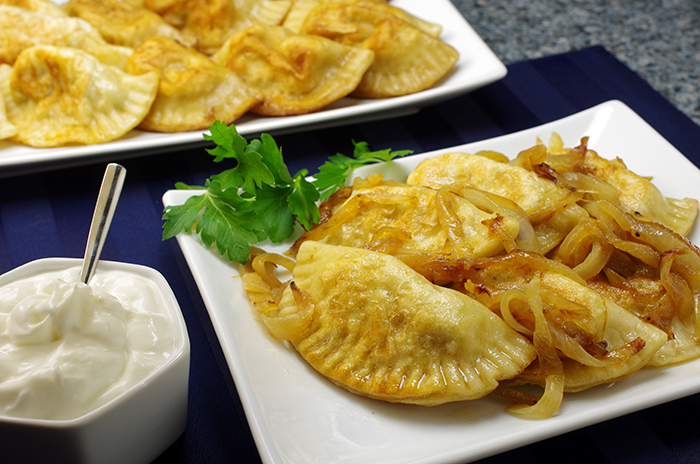 Pour the cooked onions over the tops of the fried pierogi and serve with a bowl of sour cream on the side for those who would like to dollop some of that on, too. On a clean work surface, mound the flour and make a well in the center. Add the egg, vegetable oil, and salt to the well and carefully beat together with a fork without incorporating the flour. Continue stirring with a wooden spoon, adding small amounts of the warm water, and gradually incorporating the flour. 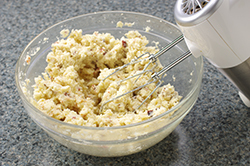 Only add the next bit of water when the last has been thoroughly blended with the flour and the mixture has become dry. Once the dough has begun to form, lose the spoon and knead the dough with your hands. Stop adding water once all the flour has been incorporated and a soft dough has formed (it should not feel wet or sticky – if it doesn’t, add a little more flour). Grab a kitchen timer and set for 8 minutes. Continue to knead the dough until the timer goes off, dusting the work surface with flour as needed to keep the dough from sticking. It should be smooth and elastic. Invert a bowl over the dough and let it rest at room temperature for 1 hour. Meanwhile, make the filling and bring a large pot of salted water to a boil. Roll out the dough on a lightly floured work surface until about 1/8 in/3 mm thick. Cut circles 2 to 3 in/5 to 7.5 cm in diameter with either the rim of a glass or a cookie cutter. Spoon about 1 tbsp of filling in the center of each one, and fold the dough over the filling to make a half circle. (Don’t overfill, or the pierogi will become difficult to seal.) 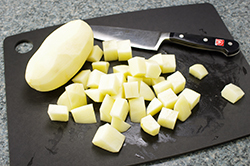 Crimp the edges with your fingers or the tines of a fork so they are well sealed (dampen the edges first if necessary). Boil the pierogi in batches, for 5 minutes after they have floated to the surface of the water. Remove from the water with a slotted spoon and set aside on a large plate or platter. 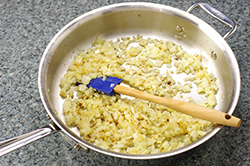 In a large frying pan, melt the butter over medium-high heat and lightly brown the cooked pierogi in batches – as many as will fit in the pan without crowding, turning once and adding more butter to the pan if necessary between batches. Transfer to a warm platter, top as directed, and serve immediately.